Highlights FORMULATION: Provided as 50% aqueous slurry containing 20% ethanol. 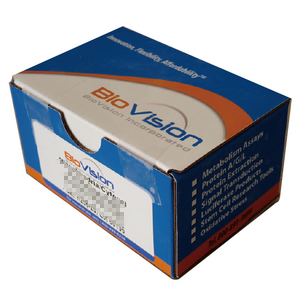 Ligand Density: 8-10 µmol Cibacron Blue 3G-A per ml of drained gel/resin. BINDING CAPACITY: The binding capacity of the Hi-Bind™ Cibacron Blue 3G-A-Agarose beads is >18 mg of Human Serum Albumin per ml of the drained gel/resin. 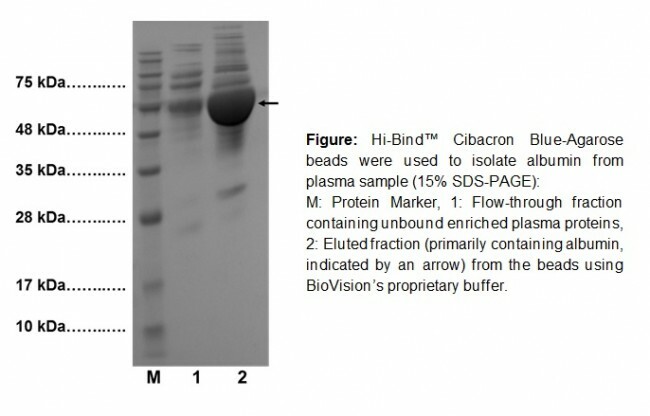 APPLICATIONS: BioVision’s Hi-Bind™ Cibacron Blue-Agarose beads can be used as an affinity purification matrix of variety of proteins for subsequent ELISA, immunoassays and other downstream analyses such as gel electrophoresis, functional assays, etc.